I was actually a bit skeptical about this book, which was described to me as being full of awesome 80s nostalgia. I was fairly young in the 80s, and I honestly didn't particularly care for them the first time around. But this book blew me away! I was sucked right in, and it sang to my geeky little heart. It's particularly impressive for a first novel. It's true, as some reviews lament, that there are some instances of info-dump. Most of these were shared with us as the main character, Wade, explaining some lore about the great James Halliday, maker of the OASIS virtual reality world – a world in which people live more often than the 'real' one. The world-building could have been a bit smoother without info-dump, but it actually wasn't all that bad, and was probably helpful for non-geeks who are unfamiliar with the various geekdom references. There were a lot of those references, especially with regards to video games, that I didn't get, myself, but it was either explained or didn't hamper the flow in any way. And there were tons of references that I did get and loved. 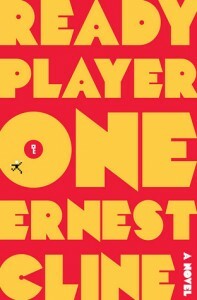 It may seem like Cline was dropping in references to any fandom he could, connecting with a fervent pre-made fanbase, but they all managed to work in the story. I learned a lot of esoteric (well, to me) gamer lore that I'd never known before. I squeed and nodded appreciatively when my own fandoms made appearances. The characters were believable and individual, working as realized characters rather than stereotypes. The pacing was good and always kept me moving forward – and staying up late to read more. While a lot of it was a bit predictable (at least from a writer standpoint), there were several twists that surprised and impressed me. There were a couple of instances that could arguably skirt too close to deus ex machina, but they actually fit pretty well with the 'wise mentor' literary device of the hero's journey. And, honestly, a bit of help here and there is a bit more believable than a teenaged MC conquering every single thing on his own. All in all, a fabulous book that I had to really look for weaknesses to mention in my review. It kept my attention the whole time, had a great voice, awesome storylines, fun virtual worlds (and I'm usually not a fan, honestly). I just really, really enjoyed it.